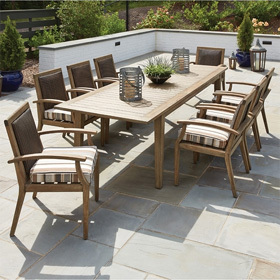 Outdoor tables are a key element of any patio space. Within our extensive selection of tables, you'll find centerpiece and accessory options designed to coordinate perfectly with deep seating furniture. We have outdoor chat tables and outdoor coffee tables that are ideal matches for lounge seating, as well as console tables, side tables and end tables that supply extra surface space. Outdoor tables can be browsed by shape, size or base materials such as aluminum, wicker and wrought iron. Plus, a wide variety of stylish table top options are available, including cast aluminum, glass, slat top and many more. For further personalization, you can also select custom finish colors for most table styles.